The unique resort known today as Skyline Lodge and Restaurant was constructed circa 1929. Originally the dream of Howard Randall and purportedly designed by Arthur Kelsey with a strong Frank Lloyd Wright influence, it was constructed by renowned local builder Jack Wilcox. 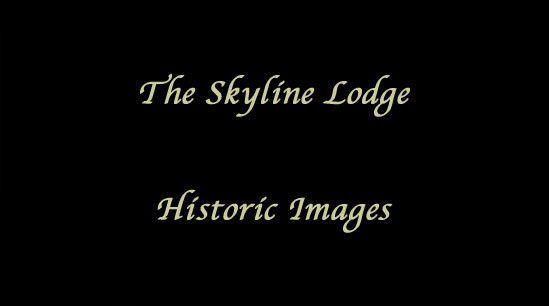 The slide show below contains historic images of the architect’s original plans and the building of the Skyline Lodge. Skyline is nestled atop a 4,300-ft. high mountain, surrounded by 50 magnificent acres of old growth conifers and hardwoods. The original twenty room retreat, constructed of chestnut, native stone, and hand cut cedar shakes, was designed as a deluxe hotel, catering to the wealthy of the 1930?s era. The original plans included a dining room, kitchen, servants? quarters, and the magnificent main lodge. In addition, the plans included a stocked lake, picturesque dam, water turbine gristmill, tennis courts, bowling alley, and a swimming pool. There were also plans for ten cottages on the upper tier. Howard Randall?s dream was never achieved as a result of the stock market crash and the depression that followed. Hard economic times made funds and wealthy patrons non-existent. According to local lore, Howard Randall died shortly thereafter leaving the unfinished project to Jack Wilcox, the builder, in lieu of payment for the completed work. The hotel then fell into disrepair and was a popular haunt for the local young folk during the 35 years that followed, many of whom have wonderful stories to tell. In 1965, a group of investors purchased the remains and a major project ensued. A Redwood interior and stone fireplaces added warmth to the rooms. A glorious hotel emerged from the rubble and is what you see today. In 1968, Oren McCain, an attorney from of Winston-Salem, purchased the hotel and began subdividing the surrounding property. The fourth owner, Frank Davis of Miami, bought Skyline and ran it as a year-round resort. He added paved roads and began a successful restaurant business that lasted from 1971 until his death in 1973. He left the hotel to Paul and Lucille Roberge who continued his success until 1981, when the Roberges sold the hotel. The next proprietors were the Jannichs, who operated Skyline up until the current owner Bob Nass purchased it in 1993. Bob Nass from Pennsylvania has taken great pride in continuing to renovate and improve this glorious landmark in the Frank Lloyd Wright tradition. We at Skyline Lodge & Restaurant hope that you have enjoyed this brief history and hope that you choose Skyline Lodge & Restaurant for your mountain getaway!